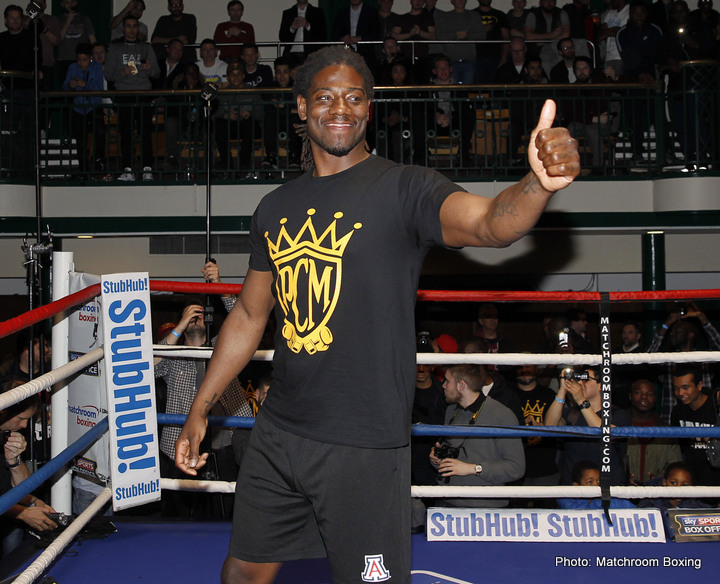 On the fast-approaching March 3 card headlined by Deontay Wilder Vs. Luis Ortiz, former IBF heavyweight champ “Prince” Charles Williams will look to make it to 3-0 in the comeback he launched after his terrible showing against Anthony Joshua. Martin, a talented southpaw, disappointed in a major way when he fell apart inside just a couple of rounds in London in April of 2016, losing his belt in the process. Since then, the 31 year old who is 25-1-1(23) overall, has reeled off two quick comeback wins and, he says he is serious about becoming a champion all over again: “Taking over where I left off,” Martin said. On the March 3 card in Brooklyn at The Barclays Centre, Martin will face a possible live opponent in the form of 29 year old Curtis Harper. Harper, 13-5(9) is no world-beater, but when he’s motivated, he can prove to be a handful – especially if the guys he’s in with is not fully prepared for battle. This is what happened back in March of 2015, when Harper, known as “The Hurt,” went in with former word title challenger Chris Arreola. By his own admission having eaten a lot of pizza in the run-up to what he felt would be a straightforward affair, Arreola instead had to dig deep to pound out a unanimous, but close, eight-round decision in what turned out to be a great action slugfest. If Harper is as determined to win as he was against Arreola, and if Martin is in less than great shape, as was the case with “The Nightmare,” then we could perhaps have a fun fight on our hands next month. Since dropping the decision to Arreola (Harper wanted a second go at Arreola but it didn’t happen – by the way, has fan-fave Arreola retired for good? ), Harper has gone 1-1. He was stopped quite swiftly by giant Chinese puncher Zhilei Zhang and he then picked up a TKO win over Andrew Greeley. The Greeley fight took place in August, so we don’t know what kind of shape Harper will be in for the Martin fight. Still, as was the case against Arreola, Harper has a big opportunity ahead of him against Martin. It could end quick, and Martin is of course a big favourite to win, but it is possible the action could go quite a few rounds. Martin himself has not boxed since July of last year and he has had just the two outings since losing to AJ, so he may not be ultra-sharp himself. Again, it could prove to be a fun fight. Martin-Harper is scheduled for eight-rounds.